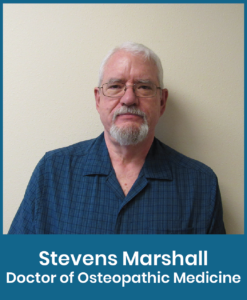 Dr. Stevens Marshall joined Columbia River Health in 2017 after moving to Boardman with his wife. He has been a wonderful addition to the community and is beloved by patients and staff alike. He graduated with honors from The University of Health Sciences, College of Osteo Medicine in 1978.